The central block of the religion of the Jews (Judaism) is centred on what they call the ten commandments. 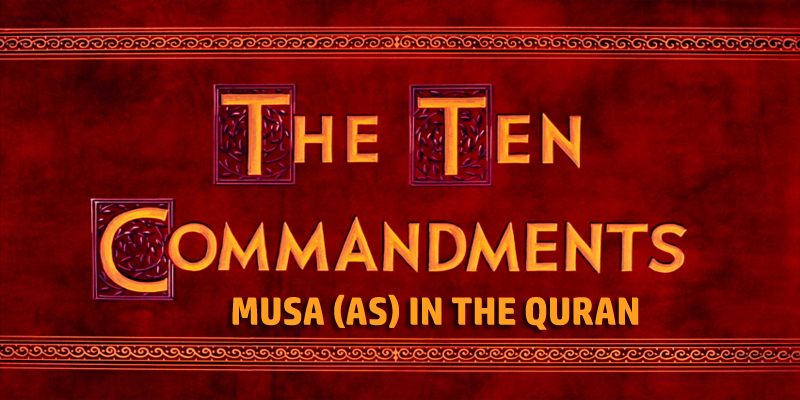 The Quran confirms that the ten commandments were given to Musa (alayhi salam). The Christians also believe in the Ten Commandments. They were given to Musa (alayhi salam) at a time when the Israelites were lost and in need of guidance. Similarly these are lessons for us Muslims when we are lost and in need of guidance. The Arabic word for what the Judeo-Christian literature call “commandments” is “wasiya”– which literally translates to “will.” It is like the will of the prophets (peace be upon them) for their followers that they have left. A will is to be acted upon and is a summary of the most important things that one wants their inheritors to do after their death. Abdullah ibn Masud (radi Allahu anhu) actually said, Whoever wishes to ascertain the will of Prophet Muhammad on which the Prophet has put his seal, let him read the Statement of God . . ., and then he recited the three verses. [Narrated by Tirmidhi] This is the will of our beloved left as a bequest for us. 1) Do not ascribe anything as a partner to Him. The first commandment is that upon which all the Prophets called to first. It is to not ascribe any partners to Allah whether in our beliefs, words or actions. It is to believe solely that Allah is the One who created and sustains this earth, that He is the source of benefit and that He is deserving of our worship. It also entails that we do deeds seeking only His favour and not anything of His creation. Allah is Self-Sufficient, and we are not to put anything else between us and Allah. 2) Be good to your parents. 3) Do not kill your children in fear of poverty– We will provide for you and for them. 4) Stay well away from committing obscenities, whether openly . . .
5) . . . or in secret. This is a clear order to stay away from both public and private sins. 6) Do not take the life God has made sacred, except by right. Allah declares that human life is sacred. This abolishes any form of indiscriminate killing or mutiliation that sometimes are done in the name of Islam. 7) Stay well away from the property of orphans, except with the best [intentions], until they come of age. 8) Give full measure and weight, according to justice– We do not burden any soul with more than it can bear. Allah exhorts us to be honest in our dealings with people. 9) When you speak, be just, even if it concerns a relative. 10) Keep any promises you make in God’s name. Allah then further tells us to be just, and to keep our promises.